is also known by her knit bombing name, K Witta. Also, an accomplished musician, Sally has worked with her knitting group, the Knit Wits, to "bomb" the Lakewood Library, the AT&T Performing Arts Center, Klyde Warren Park and most recently Dallas Heritage Village. In 2014, she had her first solo show at Mary Tomás Studio Gallery. She has a wonderful husband and two great kids who put up with a lot of crazy ideas and lint all over the house, but they have great sweaters and socks. When she is not knitting, she sells advertising for the Advocate Magazine and tours Europe with her band the Texas Gypsies in the summer. is a professional ceramic artists producing textural hand-built ceramics at her home studio. She is a Dallas native and a visual arts graduate of Booker T. Washington High School for the Performing and Visual Arts. She obtained her BFA in Ceramics and Painting from the University of Texas at Austin. When she is not teaching, Lynn travels the world with her architect husband. is a classically trained artist who also works on video game and animation projects as a concept and story board artist. He is also professional caricature artist and has also been a featured artist in many ArtLoveMagic shows, including the select annual "Underground" Art Show as well as the Artist vs Architects show. JC has also worked as a producer in the animation and film industry with his latest project being the award winning Niko and the Sword of Light. Last year he was one of the select artists that was chosen to draw at Stan Lee’s 94th birthday party to celebrate the legendary writer. Currently, JC is getting ready to publish his own anatomy book called “Creation of Man”. is a Dallas painter and graphic designer known for her Pink Alien series and other whimsical work. Originally from Richmond, VA, she has had a number of one-person shows including Gallery@1300, Cedar Arts Gallery, 2520 Fairmont and The Boyd Gallery and was selected for the D Magazine Art Slam at F.I.G. Her work is in both public and private collections. For four years, Katherine worked with an outreach art program between Lakewood Elementary and Vickery Towers. Currently, Katherine works with Big Thought in their after school program teaching art, and at Methodist Cancer Center as their Artist-in-Resident. She obtained a BA in Graphic Design from East Texas State University. is a certified Kaizen-Muse Creativity Coach and works as a consultant with groups, businesses and individuals through one-on-one coaching, classes, workshops and retreats. She is the founder of Creative Oasis Coaching and is a performing singer-song writer. Jill is passionate about helping people make the time and space in their busy lives to enjoy creative fulfillment. has been a watercolor painter for more than 30 years and has exhibited and taught classes to adults throughout the southwest. She earned a MFA at Vermont College of Norwich University and was a college art professor for 10 years. Her paintings are representational and typically depict psychological realities. As a teacher, Kay strives to help budding artists access their unique vision and find their own voices. is happily into her third career---as a hand weaver! After working as a clinical psychologist and an ordained minister for 35 years, Anne immersed herself in fiber arts after stumbling upon weaving at a retreat center, Holden Village, several years ago. Today her days are filled with weaving, cycling, teaching and traveling with her weaving-tolerant husband. She is the owner of Tissé Designs and specializes in fine wearable handwovens and home goods. Tissé means weaving in French! has been a professional clay artist for more than 30 years. She also works with bronze and is an internationally known illustrator of children’s literature. In 2003, Glo was sponsored by CIVITAS as a visiting artist to the Ukraine. Her work is sold through numerous galleries across the U.S. She holds a BA from Abilene Christian College. works with both traditional media and new technology as she explores her interests in layers. Whether these layers are the physical layers of paper on paper in collage or digital layers in Photoshop, she uses them to reflect on the entangled complexity of perception which creates beauty in life and art. Rebecca has written tutorials for Cloth Paper Scissors Magazine and her work has been featured in Somerset Gallery Magazine, The Dallas Morning News and many other publications. Holding a BFA from the University of North Texas, Rebecca is currently a digital pet portrait artist and owner of Artpaw.com as well as a Mixed Media Mosaic artist. is a mosaic artist who delights in the breaking of things so she may reassemble them into something newly visioned. Her practice is grounded in classical mosaic techniques dating back over 2000 years. She has studied worldwide with modern masters of this fine craft and brings to her practice a uniform sensibility for the purpose of establishing beauty and harmony. In all of Katrina’s makings there is an element of surprise waiting to be discovered. Her interest, enthusiasm and passion for her art form is contagious, making her a popular lecturer, teacher and workshop facilitator. continues her interest in the world of cultural symbols. She appropriates known symbols and deconstructs and simplifies the form to offer her own visual statement through color, pattern, repetition and texture. In her latest series “Lost in Translations” the symbols that were once used for specific communication within their cultures of origin have evolved into artifice…recognized only as decorative motifs and patterns. As the mark becomes more relevant, the meaning of the symbol continues to descend. She received a BFA in Graphic Communication and Fine Art from the University of Texas at Arlington. Her work has been featured in exhibitions in Washington, D.C. and Texas. received her BFA from the University of North Texas and subsequently accepted a job with American Airlines working on its in-flight magazine.. There she meet the marketing director for Coke-a-Cola who asked her to create some unusual mosaics with Coke products. This was the beginning of Barbara’s obsession with art. In 2007 her quest and hunger for knowledge in mosaic she traveled taking classes from the top artist across the nation as well as CAC. In 2011 Barbara and husband, David, relocated to Rockwall on eight acres and affectionately call the place Mosaic Habitat which is a welcoming environment where you can experience art in a rural setting and enjoy large-scale mosaic murals that have been created on the barn. became interested in art in childhood and painted oils in high school. She took a stained glass class in 1978 while working as an RN and was smitten. Although she continued her nursing career, her free time was spent making stained glass gifts and later, architectural windows for custom homes and churches. An interest in glass beadmaking and jewelry was sparked by a glass beadmaking workshop with Alison Sheafor and she later studied glassblowing at UTA. The diverse properties of glass itself give her an enormous palette. is an artist concerned with the contrast between nature and the man-made environment. Her ceramic sculptures playfully exploit real and imagined landscapes in a three dimensional form. Annie has a BFA in Printmaking from the University of Arizona and an MFA in Ceramics from the University of the Arts in Philadelphia, Pennsylvania. She has completed additional study with Lisa Orr in Austin, the Instituto de Bellas Artes in Faenza, Italy and at Alfred University in New York. Her work has been featured in local and national shows and competitions. She is a member of the Nasher Sculpture Center Education Board and the St. Mathew’s Cathedral Arts Guild. has taught drawing and painting to adults and children for more than 20 years. Although she has worked with a variety of materials, she prefers the rich color possibilities of oils, acrylics, colored pencils and oil pastels. Merry has exhibited in various juried and solo shows and has work in many private collections. She holds a MFA from Texas Women's University. is an artist who has studied art at both the Art Students League and the Parsons School of Design. Having devoted many years to figure drawing and clay sculpture, she feels a close connection with the importance of self-discovery in art making. Her first professional job in art was as a tapestry weaver with Scheur Tapestry Studio in Manhattan. There she made corporate tapestries for IBM, RJR Nabisco, Lakewood Wineries as well as private collectors. In addition to teaching drawing and clay with the different schools in the area, she has worked with children and seniors on large scale mural installations. Susan shows her figurative clay sculpture at Goldesberry Gallery in Houston and participates in different shows in the area. has spent 25 years as a professional ceramic artist and instructor and has recently completed her MA & MFA in ceramics from the University of Dallas under Professor Dan Hammett. Her MFA concluded with a exhibition at the JM Gallery in downtown Dallas. Previous to this endeavor Linda’s career path included many private and corporate commissions, wholesale orders, craft fairs, workshops and instructing ceramics at various venues. Linda works in a wide array of construction methods including wheel throwing, hand-building and slip casting. is a glass and mixed media artist who recently received her BFA in glass with a minor in geology from the University of Texas Arlington. Her work is process based and explores the repetitive nature of patterns, cycles and systems. Her work has been shown in juried exhibitions nationally and internationally, including New Texas Talent, Clay & Glass Biannual in California and Young Glass 2017 in Denmark, Sweden and the United Kingdom. is a self-taught leather artist who inherited his love of design from his mother and has spent his life creating items in his unique style. After discovering leather working several years ago, he has eagerly pursued the art to product beautiful bags, accessories and pet products. is an internationally known mosaic artist. She is the author of Mosaic Techniques & Traditions, from Sterling Publishing, and is currently working on a book on advanced mosaics. She is a past president of the Society of American Mosaic Artists and a director of the Associazione Interniazionale Mosaicisti Contemporanei. She has been featured HGTV’s “Modern Masters”, HDTV’s “The Art of Living” and most recently in Modern Luxe. She obtained a BFA from the California College of the Arts and a MBA from Southern Methodist University. started his art career as an illustrator, producing product, editorial and book cover illustrations. He then moved into the world of fine art and portraiture. Dave paints in a romantic realism style using a traditional approach. He has been teaching for over 20 years and studied art at Indiana University. Dave has received awards from Dallas Society of Illustrators, New York Society of Illustrators and Artist Magazine. Over the years he has volunteered with many nonprofit organizations and is just a swell guy. is an artist and an active advocate for art education both privately and collegiately. Her work has been exhibited throughout the country in galleries, fairs and contemporary art centers such as Susan Eley Fine Art in New York, Aqua Art Fair in Miami and the Center for Contemporary Art in Santa Fe. She received her BFA in Painting and Drawing from Louisiana State University then continued her studies as a fellow of the Meadows School of Art at Southern Methodist University where she was awarded her MFA in 2014. As a lifelong painter, she has a consistent studio practice and loves to share in the excitement of those discovering their own. began her passion in metal sculpting as a student to relieve the stress of her job as a mortgage broker. Beginning as an apprentice at CAC, Rene has now taught for more than 10 years. Her work can be found in public and private collections from California to Texas. She holds a MBA from the University of Texas at Arlington. is a retired art professor and an active painter and mixed media artist. He has taught at universities in Mississippi, South Carolina, Texas and Virginia. He has exhibited throughout Texas and curated several shows both nationally and internationally. As a studio artist, Chuck considers art as “his mind at play” and often uses allegorical symbols in his work. He holds an Ed.D. in Higher Education Administration from the University of North Texas and Texas Women’s University as well as both a BA and MA in Studio Drawing and Painting from the University of North Texas. is an accomplished painter, printmaker and illustrator, born and raised in Corpus Christi. His work is often reflective of his heritage, upbringing and current surroundings. Benjamin paints primarily in watercolor, using singular imagery to illustrate defining moments in his life. 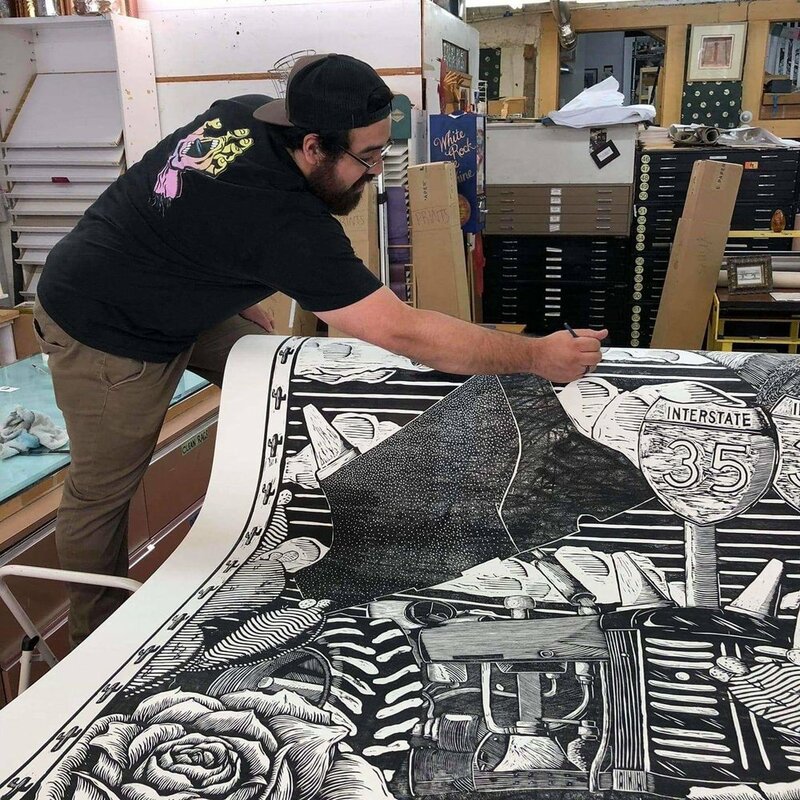 In printmaking Benjamin works in large scale woodcuts and is the owner/operator of Casa Press. He has been educating artists for several years and has a passion for helping to cultivate community and collaboration among artists. His work has been displayed throughout Texas and he has curated several exhibitions over the years. is a Texas native who received his MA from the University of Dallas with Dan Hammett and his BFA at the University of North Texas with Elmer Taylor. He also has been working and sharing a studio with Randy Brodnax for the last four years and now teaches at Booker T. Washington HSPVA. His work focuses on art that works in the way of functional ceramics and uses the clay to record the process in which it goes through. Using wheel thrown and altered forms that provide a surface for the atmospheric fire that he’s so captivated with, to leave their mark. is a textile artist and graduate of the University of Kansas with a degree in Visual Arts. She primarily works with dyes, pigments and thread to transform fabrics into pieces of art through shibori techniques, screen printing and embroidery. Born in Baton Rouge and raised in Dallas, she has found a way to translate her love of nature and organic forms into her artwork. She has come back to Dallas to share the joy of creating and knowledge of fiber arts with others. has taught metal sculpture at CAC for more than 15 years. He has been involved in the promotion of public art in multiple municipalities and educational institutions and is represented in both public and private collections and has exhibited at the Little Rock Museum of Art and obtained his MFA from Southern Methodist University. He also leads CAC’s Camp MetalHead welding program. obtained her MFA from the University of North Texas and has taught at the University of Texas at Arlington and the Dallas Museum of Art. She works in sculpture, printmaking and jewelry. Her works have been exhibited in Dallas and Atlanta galleries as well as public and private collections. has over 20 years printmaking and paper arts experience. In addition to having a BFA in Printmaking from the Swain School of Design, Terri has held several arts residencies in Venice, Italy. Her work has been featured in numerous exhibitions as well as the Texas Women’s Museum. She owns Paper Arts, a local store featuring the largest selection in the country of fine arts papers from around the world. is a Dallas native, grew up with a focus to be a 2D artist, but while pursuing his Studio Art Degree at Hardin-Simmons University, took a ceramics class and knew he was at home in the world of clay. After receiving his Bachelor’s degree, he moved to Austin, TX to work under Bridget Hauser, as a professional production potter, at Sunset Canyon Pottery. Now in Dallas, he enjoys being a potter and sharing his enthusiasm for clay and the endless possibilities afforded those who pursue it. is a recent recipient of an NEA award to work on a collaborative multi-disciplinary performance and exhibition at the Dallas Museum of Art. Holding a BA of Arts and Performance at the University of Texas at Dallas, Vet is a native Texas artist who incorporates recycling awareness and arts education within her projects and residencies. In addition to CAC, her affiliations include the Texas Commission on the Arts, North East Texas Library Systems, City of Dallas Neighborhood Touring Program, Dallas Independent School District, Crow Collection of Asian Art, Irving Art Center, Junior Players, Young Audiences/Big Thought, Youth Services Council, Good Shepard Episcopal School, Booker T. Washington HSPVA and numerous other local arts organizations. is a sculptor who works in clay, bronze and stone with a BFA the University of North Texas. She also teaches horseback riding and dance when she is not at CAC. She believes “where there is passion there are no failures, there are only goals reached and goals not yet achieved". is an accomplished figurative sculptor who works in stone, clay and bronze. Although known for sculpting realistic figures, Art has recently devoted his attention to carving abstract pieces. He has won a national award from Sculptural Pursuit Magazine and his work has been exhibited in museums and galleries and can be found in both public and private collections. Art has studied at the Marble Institute of Colorado and the Scottsdale Artist School, and has served as a featured instructor at 2sculpt workshops in Lawrence, KS since for the last decade.